author Kanatas, I.; Griffiths, W. K.; Dickens, R. J.; Penny, A. J.
Messier 4 (also known as M4 or NGC 6121) is a globular cluster in the constellation Scorpius. It was discovered by Philippe Loys de Cheseaux in 1746 and catalogued by Charles Messier in 1764. M4 was the first globular cluster in which individual stars were resolved. M4 is conspicuous in even the smallest of telescopes as a fuzzy ball of light. It is also the one of the easiest globular clusters to find, being located only 1.3 degrees west of the bright star Antares, with both objects being visible in a wide field telescope. 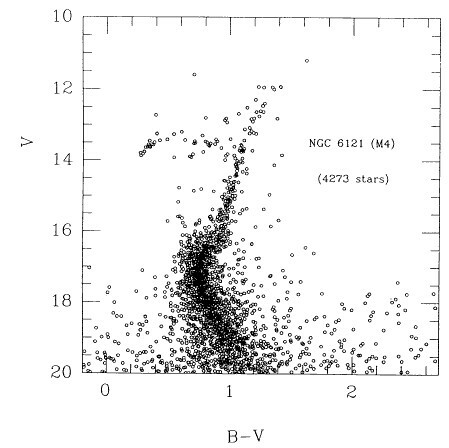 Modestly sized telescopes will begin to resolve individual stars of which the brightest in M4 are of apparent magnitude 10.8. The cluster carries a characteristic "bar" structure across its core, visible in images (including the one below, extending from upper left to lower right) and moderate sized telescopes. The structure consists of 11th magnitude stars and is approximately 2.5' long and was first noted by William Herschel in 1783. Valcarce, A. A. R.; Catelan, M.; Alonso-Garc�a, J.; Cort�s, C.; De Medeiros, J. R.
2014, The Astrophysical Journal, Volume 782, Issue 2, article id. 85, 8 pp.